The Climate Column has covered practices that allow farmers to reduce emissions and sink carbon into their soil, like no-till, as well as methods that help farmers secure the food system by adapting to the changing climate, like intercropping. As the harmful consequences of climate change increase, these independent, on-farm actions will become even more important. But farmers will also need to look past the fencerow and coordinate with others to successfully manage climate change risk in their communities. By interfacing with their communities, farmers can both ensure climate change is a consideration in community endeavors that impact their businesses, such as transportation infrastructure planning, as well as secure greater reductions in greenhouse gas emissions, thereby preserving as much climate stability as possible. Farmers are busy, and participation in local governance can be time consuming. Fortunately, there are resources that streamline the process, saving farmers valuable minutes and hours in their hectic schedules. Climate Smart Communities Certification is a process established by New York State that offers farmers resources they can use to mobilize their communities to address climate change. The certification manual helps local governments look for ways to reduce greenhouse gasses in enterprises under their direct control, like reducing fossil fuel use in municipal vehicle fleets and improving solid waste management. It also includes resources for climate-smart land-use and establishing local climate change adaptation strategies. The material is dense, but it’s well-organized and collected in a central location. 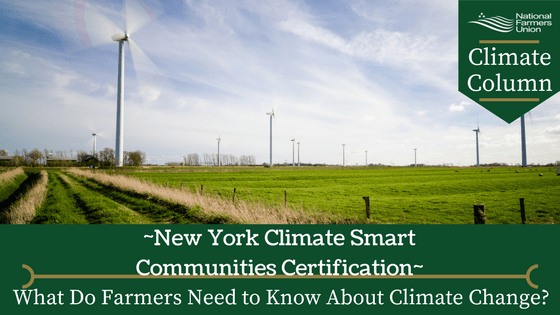 A New York farmer interested in climate-smart advocacy at the local level could make good use of and build a strong coalition around the Climate Smart Communities Certification Manual. Farmers can take the manual to their municipal, county, and other local governing bodies to drive climate-smart decision making, ultimately mitigating the risk the farmer faces from climate change. Along that way, they’ll learn about topics that will enhance decision-making for their businesses and drive economic growth in their areas, such as attracting environmentally friendly businesses to their towns and villages. Do Climate Leaders living and working in New York State live in certified Climate Smart Communities? If not, could you use these resources to work on climate resilience with your local governments? Do Climate Leaders outside of New York State think a similar program could work in their states? Why or why not? Please share your thoughts in the comments below.